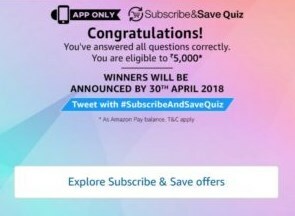 Amazon is once again back with another Quiz Contest based on it s “Subscribe & Save” option. You can get to win Rs 5000 on answering all questions correctly. A total of 40 winners will be declared. We have also added all the answers of today’s contest below. Hurry up and participate now. 2 . Open the app and you will see a banner about the Subscribe & Save contest. Click on it. Q1) Using Subscribe & Save, you can set up regular scheduled deliveries and earn savings on your daily essentials. Q2) Which of the following is NOT a benefit of using Subscribe & Save? Q3) Currently, on paying for subscriptions using Amazon Pay balance, which of these is a benefit you can avail? Q4) Subscribe & Save’s monthly subscription box offers curated products for your everyday personal & household needs. What is subscription box called? 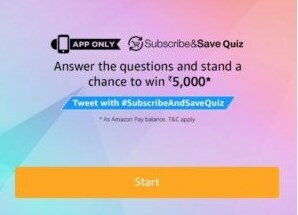 Q5) What is the current ‘Fest’ running on Subscribe & Save, which gives you minimum 25% off called? 5. After answering all 5 questions correctly, you will get a Congratulations message that you have been entered into a lucky draw. Now keep your fingers crossed and wait for the results to be announced by 30th April, 2018.